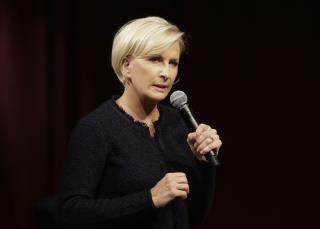 Trump: "If it was a Conservative that said what 'crazed' Mika Brzezinski stated on her show yesterday, using a certain horrible term, that person would be banned permanently from television," the president wrote. "She will probably be given a pass, despite their terrible ratings." Trump also praised Richard Grenell, the ambassador to Germany, "for having the courage to take this horrible issue on!" Grenell: The ambassador, who is gay, said Brzezinski's initial reponse to the controversy, in which she acknowledged a "SUPER BAD choice of words," didn't cut it. "I don’t see that you’ve actually apologized to gays?" he wrote. "Your words demean, mock and therefore try to control whole groups by minimizing our humanity." I guess 23 hours prior is considered long time plans for some people. Bye Felecia! Take Joe with you. "Your words demean, mock and therefore try to control whole groups by minimizing our humanity." See? The loud orange mouth knows exactly what he is doing when he disparages others, domestic and international.